The engineers found a dramatic issue with their life simulator which was running way too fast while they had their backs turned to it. Thinking about how the world wants to reduce power consumption to be "green" they quickly found a fix for it. This small tool was created after i was browsing the forums and a post came to my attention which wanted to "stop the fan from running". Of course this tool doesn't stop the fan (warranty void by reading this!) but it does something way more "healthy" and useful. 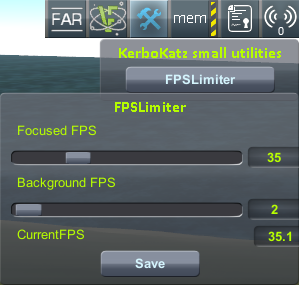 It limits the fps (frames per second) while kerbal is running in the background causing it to use less CPU & GPU cycles. In the end the CPU & GPU run cooler and the fans spin down . 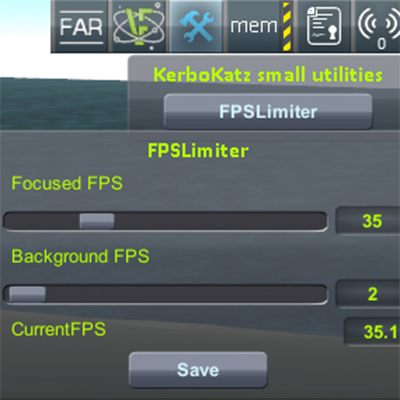 Some of you wished a simple and easy way to display the current game fps. Right-clicking on the menu entry will get you to the settings. 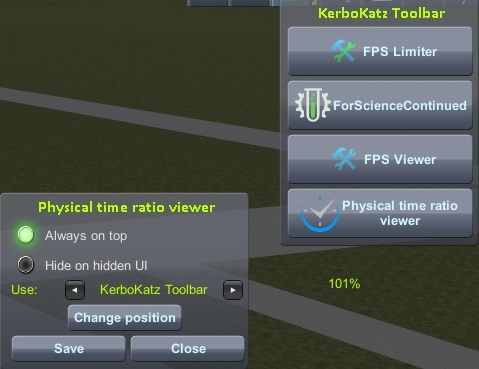 Here you can set if you want it to be always displayed on top of everything. Something else you can do here, is reset the min/max fps counter, this is especially useful to benchmark a specific scene. This little mod is very simple and modifies the explosion potential in order to create bigger or smaller explosions. For example an empty fuel tank won't look much like an explosion. On the other hand a full tank will explode in a flashy explosion. Can't really show what this does in a picture. 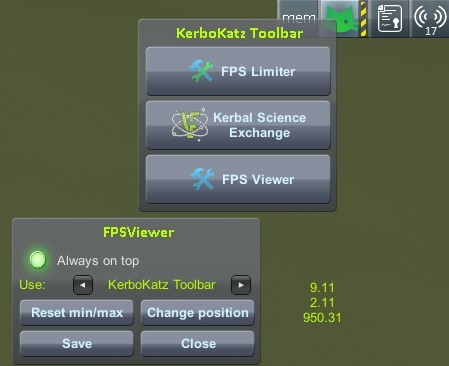 This little plugin displays a simple layer much like FPSViewer to compare ingame vs real time speed. Wanted to know by how much the time slows down with that 1000 part craft ? Now you can find out! Do you want to view/change the MaxDeltaTime ? This is the mod for you! These mods initial had their own thread. But since they are so small we decided we would merge it with this pack! Basically,as the name implies, allows you to recover/destroy all vessels with a single push of a button. These mods only show up in the tracking station. With this tiny tool you can exchange your science for funds or vice versa. This tool gives you 100 funds per day for every positive reputation point you have. Looks pretty good! Great work!